This pendant is using a silver jump ring for the bail. This is a unique one of a kind clay pendant designed by me. 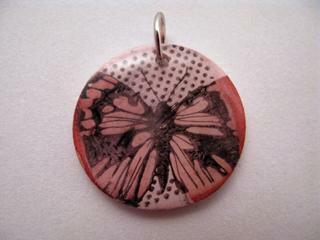 I used polymer clay and stamped image for this pendant. This is resin coated so that the image is protected. I do not know how much water can be resisted. It measures almost 1.25".